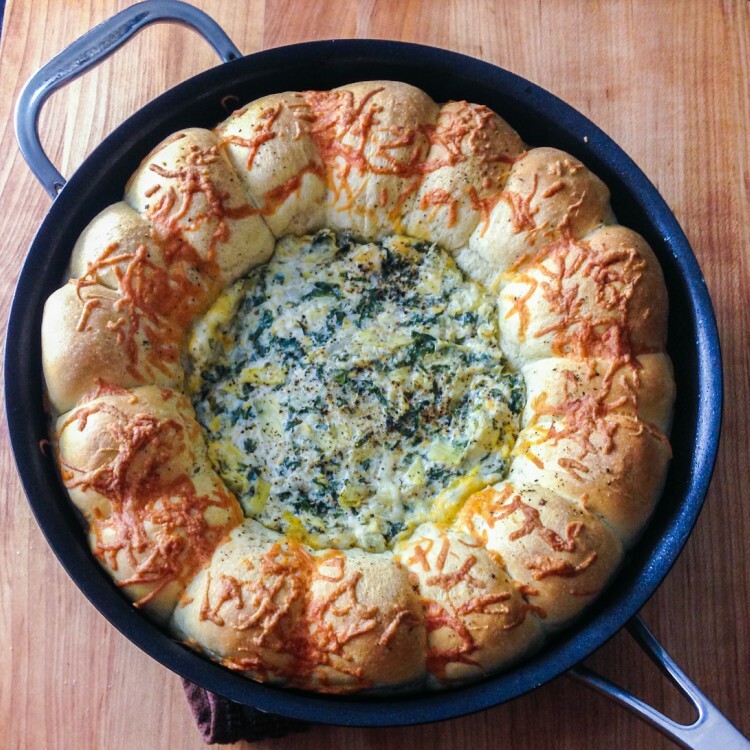 Who doesn’t love spinach and artichoke dip? It’s such an American classic, perfect for game day, parties at home, or even on picnics. This dip is so easy to make that it’s a shame most people buy theirs pre-made at the grocery store. When you make your own you can better control the flavors to your liking. Want extra garlic? Who’s gonna stop you? Want to add some hot sauce? By all means! If you have a food processor the process goes even faster. If you don’t have a food processor but you have a mixer (either standing or hand held) then you’re in luck. If you don’t have either of these don’t fret you can still make this with just a few extra minutes of stirring. Store bought bread dough is the secret to this deceptively stunning dish. If you feel like going the extra mile and making your own bread dough by all means go for it! Make sure the pan you are using is oven safe. Cast iron is a great bet but if you don’t have it anything oven safe will work. Spray the inside of your oven safe skillet with non stick cooking spray. Divide the bread dough into 16 equal portions and roll them into balls. Place those balls along the interior wall of the skillet. Spray the outside of a large bowl with nonstick spray. Place the bowl in the center of the skillet and let the dough rise, at least 30 minutes. Preheat the oven to 375°F. In a food processor combine all the remaining ingredients, except for 2 tablespoons of the shredded cheese. If using a mixer instead first beat the cream cheese until smooth, then beat in the remaining ingredients. If working by hand make sure to whisk the cream cheese well and stir together the rest. Once the bread has risen remove the bowl. Fill the cavity left behind with the dip. Sprinkle the bread with the reserved 2 tablespoons of cheese. Bake for approximately 35 minutes or until the bread has turned nice and brown and the filling has warmed through out. Allow to cool for at least 10-15 minutes before serving. You can cover the pan with tin foil while it cools to keep the dip warm. Make sure to serve with a plastic utensil if using any so as not to scratch your pan while serving.